In between workshops, shows and other events, we find time to explore ideas for new programmes. 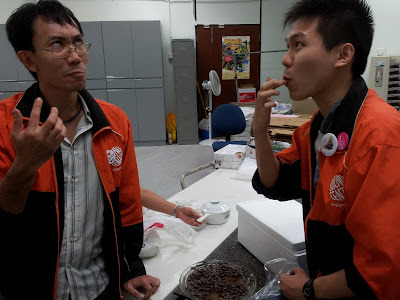 This week, over lunch, scobbers Yong, Kin Guan and myself had a number of discussions about how to demonstrate the nature of waves, light polarisation, the doppler effect and the speed of light, the kind of things that we science educators get very excited about, well some more than others. It was even more exciting when we remembered a popular demonstration that uses a microwave oven to measure the speed of light. So, coming back to the office after lunch we decided to try it out. First we needed to find something that can easily melt so we quickly procured some chocolate chips from........... somewhere. Next we headed for the microwave in the 3rd floor lab staffroom. 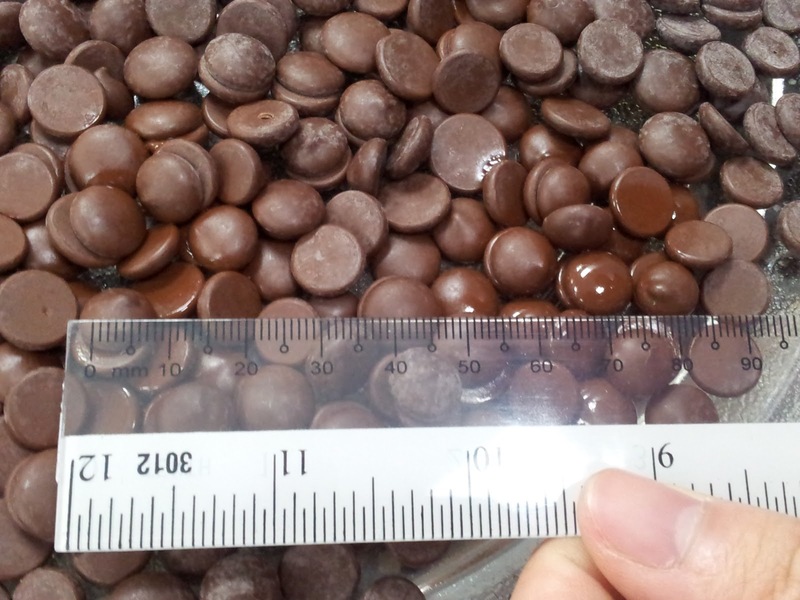 Having removed our lab attendant's lunch from the microwave, Yong gave the glass plate a wash and covered with the chocolate chips. 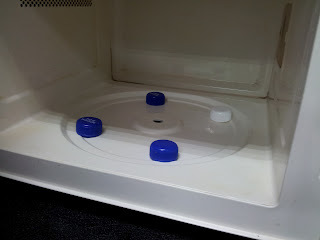 The next step was to remove the plate's base from inside the microwave so that the plate cannot spin. This is the important part as the turning motion of the plate helps spread the microwaves around whatever it is you're cooking to allow for even heating. 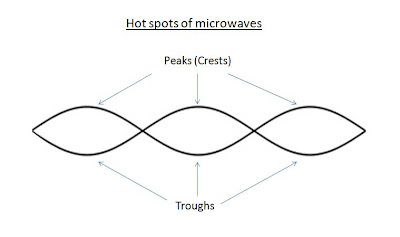 However, for this experiment we do not want an even distribution of heat, we need to identify where the hot spots of the microwaves are, so no rotation. We also used some handy bottle caps to raise the plate above to central hole and to keep it level. After the all important set up, it was time for action. 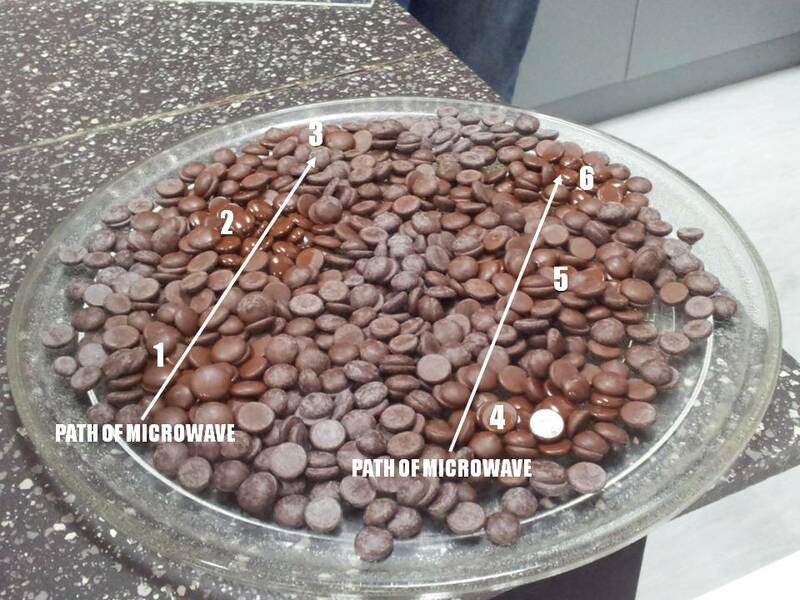 Our non-rotating plate of chocolate chips was placed in the microwave and heated at FULL POWER for about 20 seconds. As you can see from the pictures above, there were six separate partially melted areas (i.e. the shiny bits). These areas, arranged in neat parallel rows, are the so called hot spots, receiving more heat than other areas. 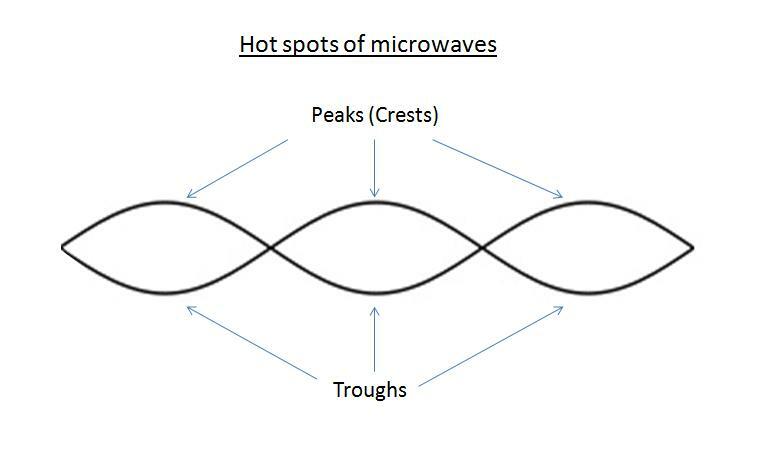 The reason for this is due to the fact that microwaves behave like.......waves, meaning that they form peaks (crests) and troughs, which are the regions where the intensity is at its greatest. Microwaves are just one form of electromagnetic radiation, similar to light. 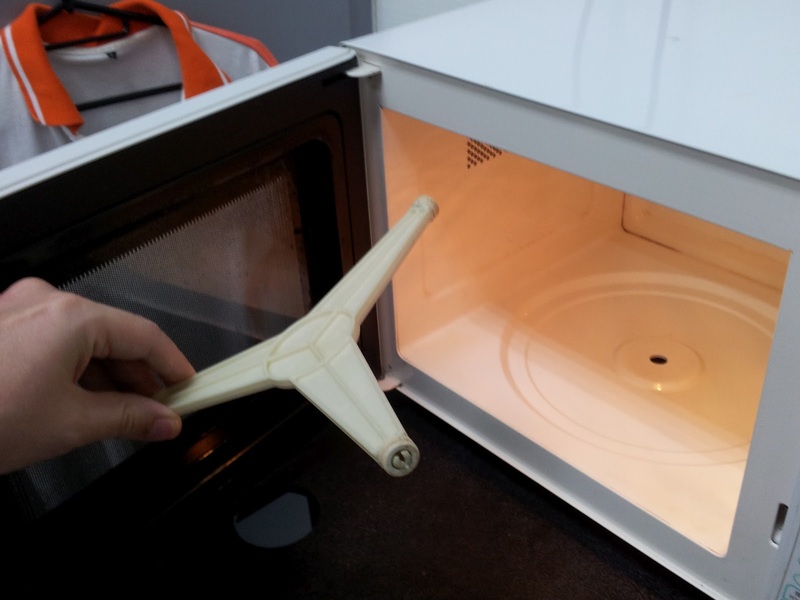 However, microwaves are long enough for us to be able to measure them using a ruler. Measuring the distance between two of the melted areas gives you the distance between one peak and one trough, which corresponds to half a wavelength. In our experiment, this distance was about 0.065 metres (or 65mm). Multiplying this number by 2, we got a wavelength of 0.13 metres. The frequency is usually printed on the back of the microwave. Our microwave's frequency was 2450 MHz (2450,000,000 Hertz). Therefore 0.13 x 2450000000 = 318,500,000 metres per second. We measured the distance between another pair of melted areas and got a second wavelength measurement of 0.12 metres. This gives a speed of 294,000,000 metres per second. Taking the average between these two speeds, we measured the speed of light to be 306,250,000 metres per second. The actual speed of light is approximately 300,000,000 metres per second. 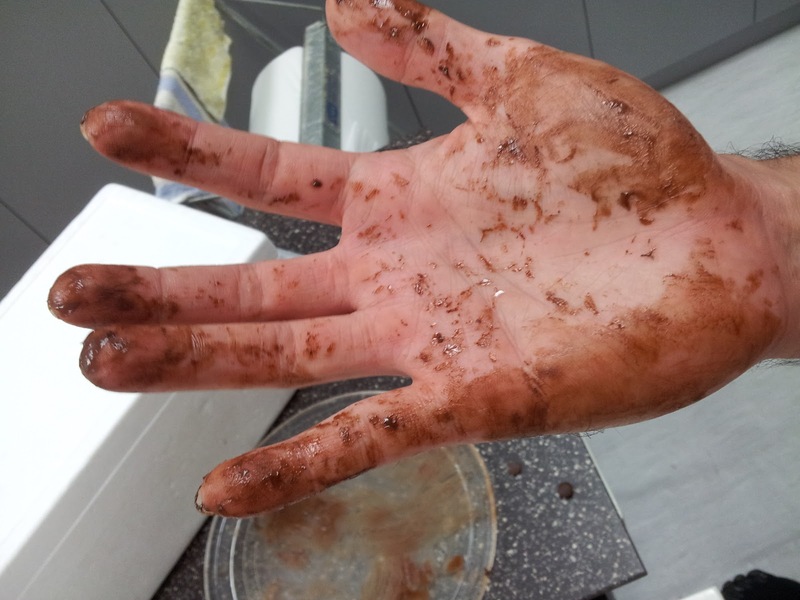 Therefore, we declared this experiment a success! Our crude attempt at measuring the speed light turned out to be realtively close to the actual value, we were only out by about 6,000,000 metres per second (hmm, maybe it sounds better if I say by 2%). 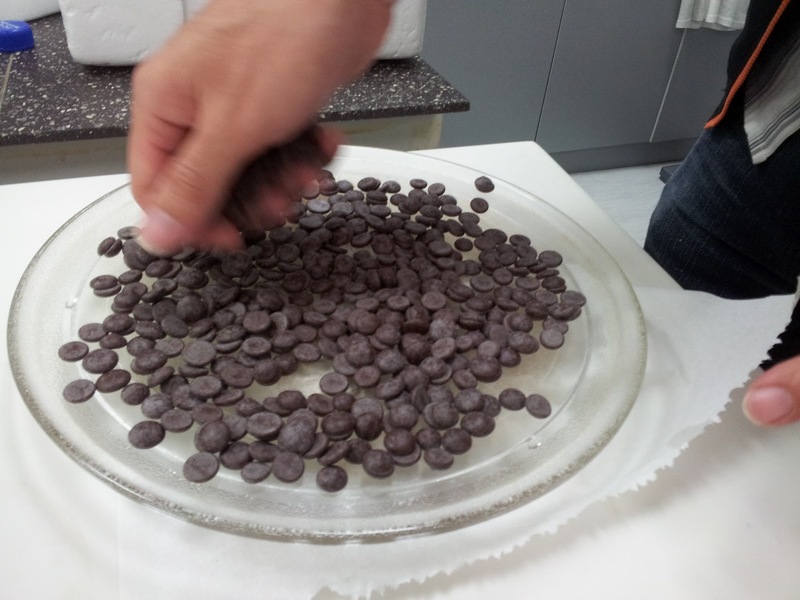 Simple science in a kitchen, and the best part is that you can eat your experiment after you're done.